The internal medicine community came together for frank and open discussion about Maintenance of Certification (MOC) at the bi-annual Liaison Committee on Certification and Recertification (LCCR) meeting September 16 in Philadelphia. The American Board of Internal Medicine (ABIM) worked with several medical specialty societies to plan the event, and 27 societies attended. The consensus in the room was that there is a role for both ABIM and societies in the MOC process and, while much remains to be done, we have made progress together. This important conversation was enhanced by the fact that several societies held internal discussions and met to share ideas in advance of LCCR. During LCCR, each society shared feedback about proposed MOC assessment pathways outlined in ABIM’s physician survey. Many offered suggestions on how to improve the proposals and asked for a clearer description of the features that differentiate what is under discussion from the 10-year exam. 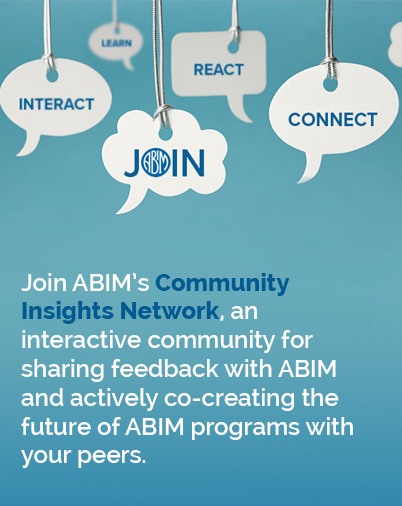 This was important feedback since the proposed assessment pathways are unlike anything ABIM has presented before. You will be able to take these proposed assessments in the convenience of your home or office. There is no need to travel to a testing center. Many of you have told us that you are interested in more of a “knowledge check in,” something that can give you confidence that you are staying current in the knowledge your peers have indicated is needed in practice and something that can be applied to how you practice. Among other feedback, we are interested in your view of what you believe the appropriate interval for this kind of “knowledge check in” should be – every 2 or 5 years? You will receive immediate overall results at the completion of the assessment. Additional feedback will follow to help you identify any knowledge gaps and find educational resources that will help you fill those knowledge gaps. We expect most certified physicians will do well and will continue in the pathway until the next check-in. If you don’t do well on one assessment, you will not lose your certification. We will continue to develop enhancements for the 10-year exam and it will remain an option for you. I appreciate the time each participant devoted to sharing thoughtful input and listening to colleagues during LCCR. Some of us will disagree about the details of proposed MOC assessment pathways, but we all agree that there is a path forward and possibilities yet to explore. As this work moves forward, please continue to send us your ideas and sign up for other opportunities to get involved.